Humans learn in three ways; hearing, seeing and doing. The most effective way is to use all three at the same time but unfortunately most learning material touches on two at a time. Video, the most popular method of learning today, covers the hearing and seeing and leaves the doing to chance. Books are even worse as it leaves you only with listening to the author's words. For most people, workshops, good workshops, target all three access points to learning effectively. The downside to any workshop is that learning is often structured to the least common denominator. If someone doesn't grasp the material the whole group slows to accommodate that one person. If you can relate to that frustration then one on one sessions may fit your needs. Don't have a budget for one on one tutoring? Have the luxury of time to get your questions answered? 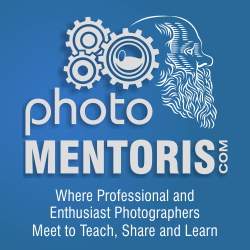 I invite you to join our small community of talented photographers at photoMENTORIS.com, an online photography forum where we encourage peer based review and critique of images in order to help each other advance in our chosen hobby/passion. Myself and a few other pros are there to help out with answering more technical questions but overall it is about encouraging each other to push ourselves artistically. I hope you take me up on this offer as I feel it is a great "undiscovered" resource for many photographers to tap into. It's free to join and participate, just sign up and start interacting in any of the online conversations. I hope to see you there. If you have any questions, please reach out to me and, as an admin there, I'll be happy to help.